Meet Farmer Mark of Parlee Farms! Parlee Farms opens around mid-June every year (exact date dependent on that year’s fruit picking conditions), but there’s a lot of work that goes into getting it ready all year long. Meet the man in charge: Farmer Mark Parlee! Almost 47 years ago, Mark began farming at the age of 12 with his uncle in Chelmsford, MA and he developed a love for farming. Before he could realistically start his own farm, he completed his formal education by receiving a degree in Chemical Engineering from UMass Lowell. Mark worked in the engineering field for 10 years before switching careers and farming full time. In 1987, along with his wife Ellen, Mark began Parlee Farms with their first planting of strawberries. In 2017, Parlee Farms is celebrating 30 years of growing fruits and vegetables! Located on 93 beautiful acres near the Merrimack River in Tyngsboro, MA, Parlee Farms offers the finest fruits, vegetables, and flowers while being environmentally responsible. Mark uses his knowledge of chemistry and biology to choose the least-toxic methods for growing and protecting crops. Under his leadership, Parlee Farms has practiced Integrated Pest Management (IPM) for more than 25 years. The objective of IPM is not to eliminate all pests, but to prevent pest populations from reaching damaging levels. As a first line of defense against damaging insects, predator insects are released into the field. Often, this release is effective in keeping damaging insects in check. Spraying is only done when a pest or disease reaches a level that could seriously harm the crop. 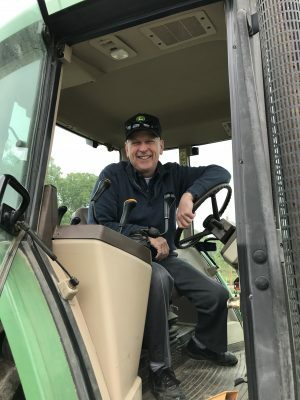 Mark is busy all year long, but spring is his busiest season since he’s planting new crops for upcoming seasons, managing frost protection for the current year’s crop, and overseeing all crop and building maintenance. However, farming isn’t a job to Mark. He loves waking up every day and going into the fields. He doesn’t have a favorite crop since each crop has its own set of challenges and that’s what he loves about farming! In addition to overseeing all farming on Parlee Farms, Mark is always learning from and sharing information with other farmers. He is a member of the Massachusetts Fruit Grower Association (where he has also served as President), Massachusetts Farm Bureau, the International Fruit Tree Association, and National Farm Direct Marketing Association.